Tony Garnett: I had read Barry Hines’s first book, The Blinder, about a young footballer and liked it. I was producing the Wednesday play at the BBC and I asked him if he fancied doing one. He told me that he had this book in his head and he had to go away and write it. His response made me warm to him even more. He was a teacher with a couple of young kids, a mortgage and so on, but he didn’t have much money. Literary novels only earned a few hundred quid in those days. He would have got a few thousand for a TV play so I said the offer was still open, but when he finished the book ( A Kestrel for a Knave ) would he let me have a look at it. As soon as I read it, I thought, let’s do it. Barry Hines: I had been a teacher in several schools in south Yorkshire so it was familiar ground. I had taught plenty of pupils like Billy Casper – I knew boys like that – so it was no great feat of imagination. I was just writing about something I knew very well. I was just married at the time and my brother, who was about 18, kept a young kestrel in the shed at the bottom of the garden so I was able to assist him in the rearing of it. Tony Garnett: Ken and I had been working together for a while for the BBC and we thought so alike on almost everything. I think too many of the films made at that time were too didactic and wore their politics on their sleeve. The joy of working on Barry’s material was that the characters really lived in their own right. Although they were embedded in historical and political realities, they were always ambiguously more than that. Ken Loach: I was struck by the simplicity of the story’s metaphor. It was not too political. It was basically a story about one boy and his bird but with plenty to say about working-class culture and aspirations of that time. We’d all seen the social realism films of the late Fifties and early Sixties and we [Tony Garnett] both felt that there must be another way forward from there. Tony Garnett: We had a budget of £165,000, but at the last minute the money (from US distributors National General) fell out. We had a whole unit standing by in Barnsley to start filming. I went all round London trying to raise the money. Everybody said no. A typical reaction was a snigger and I was told we were making a film about the wrong kind of bird. Eventually director Tony Richardson (Tom Jones) heard about our situation. He was riding high at the time. He made one call to United Artists in America and got us the money. The studio didn’t bother us until it was finished. I don’t think they even knew where Barnsley was. David Bradley: We filmed during our summer holidays in 1968 and there was a great buzz around the set. At 14, we were all a bit gawky, which I think Ken liked. He didn’t want someone who could speak clearly or properly. So there would be the occasional fluffed word or shifting movement from foot to foot during a speech followed by an embarrassed look. Colin Welland: I was the only professional actor with a major role and initially I felt inhibited by my formal experience. But I’d been a teacher for four years so I took to the role like a duck to water. The classroom scenes were filmed in an actual school so I spent a week beforehand teaching there to get to know the boys. Ken wanted people to be as natural as possible. He wouldn’t have cast me if I hadn’t been a teacher. Barry Hines: Brian Glover who played the PE teacher was a friend of mine. We had taught together. He was an English teacher and professional wrestler. He used to get his pupils to read plays out loud and he was very good at acting out the various parts. I can remember him coming into the staff room after a lesson, saying, ‘They’ve just applauded me out of the classroom.’ When he heard about the film, he asked if there might be a part in it for him and I suggested the PE teacher who was in charge of the football match. Ken Loach: The football episode in the novel was hilarious and like the rest of the film it came directly from Barry’s novel. But Brian Glover was a real find and he made the scene so memorable. David Bradley: I started work about 8.30 in morning and finished about four in the afternoon. Then I’d go to the Hineses’ house in Hoyland and train the kestrel. We had three that were named after the shoe-store chain Freeman, Hardy and Willis. Freeman is the kestrel that flies fairly low to ground, whereas Hardy flies from a fairly high vantage point and he would swoop down at me. Willis, unfortunately, was completely neurotic and psychotic and we couldn’t use him. Hardy was the one I trained. Barry Hines: My brother Richard trained the kestrels and he did wonders on a tight schedule. It’s not like working with a trained dog. A kestrel has to be the right weight. They only fly if they’re hungry so we would weigh them before a scene and if they were too heavy they had to wait to shoot the scene. It was imperative that Billy had to appear able to fly the birds but he wasn’t a natural. There was something magical about kestrels. They demanded an instant respect but David had none of that. He wouldn’t have known a sparrow from an eagle. It took about a month of quite intensive training, but in the end he pulled it off. 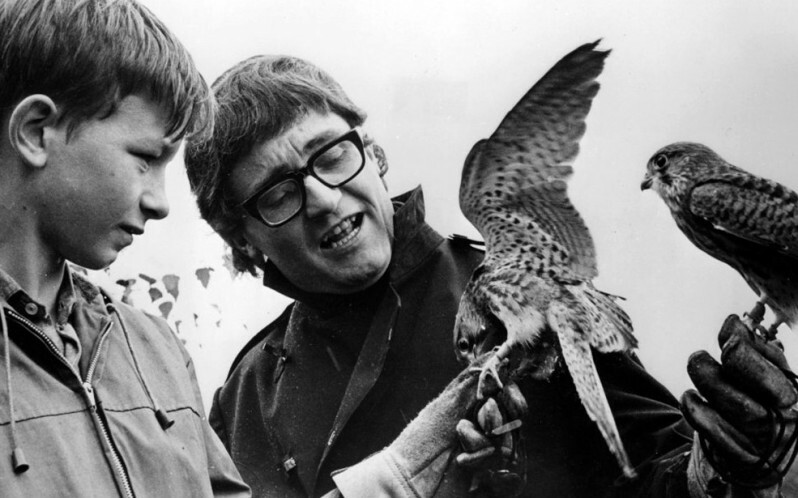 David Bradley: I grew quite attached to the kestrels by the end of the shoot. I couldn’t believe it when they said they had to kill him for the end sequence. I was really miffed when it came to do that sequence and it was quite upsetting. In fact they found a kestrel in Scotland that had died of natural causes. So after we filmed those scenes I went back up to Hoyland, apparently to train Freeman but Hardy was there. I later realised that they were trying to create an emotion for the scene and I wasn’t upset with them for the deception. Colin Welland: Ken was always trying to surprise the actors. In the school assembly scene Ken had organised a real member of staff to pick a particular boy who had been coughing and drag him out of the room. At the last minute, Loach told the actor playing the headmaster to pick a completely different teacher who obviously chose the wrong child. So in the finished film, the unlucky boy was really protesting his innocence as he’s dragged out into the hallway. There was a tremendous freshness about that scene. Ken Loach: There was a standard way of making social-realist type films that involved lots of hand-held camera which followed the characters around and that sort of thing. I wanted to avoid all that. Kes was a break from the whole style I’d been using since Up the Junction. I turned my back on trying to make things look too cinematic. Barry Hines: I was on set every day and saw the rushes. I could tell it was going to be good. I had seen the TV plays that Ken and Tony had made and thought, ‘Yes, that’s the real thing.’ If they couldn’t make a good job of it, no one could. Tony Garnett: After we had edited the film, I showed it to a visiting United Artists executive at a private viewing. He watched it in silence. When it finished he didn’t even break stride, he walked past me and said, ‘I would have preferred it in Hungarian.’ He didn’t understand a word of it so obviously they wouldn’t release it. Colin Welland: They wouldn’t release the film in the States without dubbing it first, which Ken refused. I also remember one of the American studio guys wanted us to shoot another, happier ending, where Mr Farthing gets Billy a job at the zoo. Ken Loach: I don’t remember if anyone proposed changing the ending, but it’s the kind of crass thing we heard from the studio people.